ASI Waste can deliver a variety of sanitary portable restrooms for your construction job site. We supply quality portable restrooms with a commitment to excellence! We offer standard and deluxe portable restrooms. We can supply portable restrooms that are customized to be ADA accessible. We provide portable wash stations as well as portable waste systems with wastewater holding tanks. We offer a standard weekly cleaning of the portable restrooms, which ensures that the facilities are clean and fully stocked. More frequent pumping services and cleaning is available if required. We provide the service based on your needs to ensure your job site is running smooth. No matter what options you select, our portable restrooms will keep your job site running efficiently. 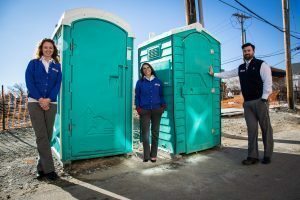 We can assist you if you are unsure of what type of portable restroom is best for your job site. Contact us for a recommendation for your portable restroom needs. We will provide a solution based on the number of employees and duration of your construction project.